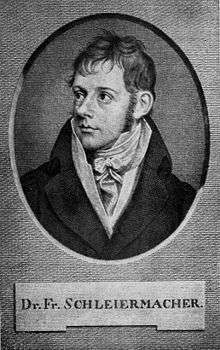 Friedrich Daniel Ernst Schleiermacher (German: [ˈʃlaɪɐˌmaχɐ]; November 21, 1768 – February 12, 1834) was a German theologian, philosopher, and biblical scholar known for his attempt to reconcile the criticisms of the Enlightenment with traditional Protestant Christianity. 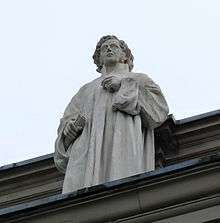 He also became influential in the evolution of Higher Criticism, and his work forms part of the foundation of the modern field of hermeneutics. Because of his profound effect on subsequent Christian thought, he is often called the "Father of Modern Liberal Theology" and is considered an early leader in liberal Christianity. The Neo-Orthodoxy movement of the twentieth century, typically (though not without challenge) seen to be spearheaded by Karl Barth, was in many ways an attempt to challenge his influence. 1 2 Friedrich Schleiermacher, "Ueber den Begriff der Hermeneutik mit Bezug auf F. A. Wolfs Andeutungen und Asts Lehrbuch", lecture delivered on 13 August 1829; published in Friedrich Schleiermachers sämtliche Werke III/3, 1838 (Schleiermacher makes reference to Ast's Grundlinien der Grammatik, Hermeneutik und Kritik (1808) and Wolf's Vorlesungen über die Enzyklopädie der Altertumswissenschaft (1831)); Richard E. Palmer, Hermeneutics, Northwestern University Press, 1969, ch. 6. ↑ Herbermann, Charles, ed. (1913). "Zionites". Catholic Encyclopedia. New York: Robert Appleton Company. Retrieved 18 June 2014. 1 2 B. A. Gerrish, A Prince of the Church: Schleiermacher and the Beginnings of Modern Theology (Philadelphia, PA: Fortress Press, 1984), p. 25. ↑ Palmer, Richard E. Hermeneutics. Evanston, Illinois: Northwestern University Press, 1969. ↑ Schleiermacher, Friedrich D. E. "The Hermeneutics: Outline of the 1819 Lectures," New Literary History, Vol.10, No. 1, Literary Hermeneutics (Autumn, 1978), 1. ↑ Schleiermacher, Friedrich D. E. "The Hermeneutics: Outline of the 1819 Lectures," New Literary History, Vol.10, No. 1, Literary Hermeneutics (Autumn, 1978), 2-3. ↑ Schleiermacher, Friedrich D. E. ed. Andrew Bowie. Hermeneutics and Criticism. Cambridge, U.K.: Cambridge University Press, 229. ↑ Schleiermacher, Friedrich D. E. "The Hermeneutics: Outline of the 1819 Lectures," New Literary History, Vol. 10, No. 1, Literary Hermeneutics (Autumn, 1978), 5;10. ↑ Friedrich D. E. Schleiermacher, "The Hermeneutics: Outline of the 1819 Lectures," New Literary History, Vol. 10, No. 1, Literary Hermeneutics (Autumn, 1978), 6. ↑ Schleiermacher, Friedrich D. E. ed. Andrew Bowie. Hermeneutics and Criticism. Cambridge, U.K.: Cambridge University Press, 232. ↑ Schleiermacher, Friedrich D. E. "The Hermeneutics: Outline of the 1819 Lectures," New Literary History, Vol. 10, No. 1, Literary Hermeneutics (Autumn, 1978), 9. ↑ Schleiermacher, Friedrich D. E. ed. Andrew Bowie. Hermeneutics and Criticism. Cambridge, U.K.: Cambridge University Press, 256. ↑ Palmer, Richard (1969). Hermeneutics: Interpretation Theory in Schleiermacher, Dilthey, Heidegger, and Gadamer. Evanston, IL: Northwestern University Press. pp. 87–88. ISBN 9780810104594. ↑ Schleiermacher, Friedrich D. E. "The Hermeneutics: Outline of the 1819 Lectures," New Literary History, Vol. 10, No. 1, Literary Hermeneutics (Autumn, 1978), 14. ↑ Schleiermacher, Friedrich D. E. ed. Andrew Bowie. Hermeneutics and Criticism. Cambridge, U.K.: Cambridge University Press, 227. ↑ Palmer, Richard (1969). Hermeneutics. Evanston, IL: Northwestern University Press. pp. 96–97. ISBN 9780810104594. ↑ Gunton, Colin E. The Cambridge Companion to Christian Doctrine. p. 240. ↑ F. Scheiermacher, On Religion, Ch.1, pp12-13. ↑ Rendtorff, Trutz. Church and Theology: The Systematic Function of the Church Concept in Modern Theology, Westminster Press, 1971, ISBN 978-0-664-20908-7. ↑ Woo, B. Hoon (2015). "Bavinck and Barth on Schleiermacher's Doctrine of Revelation". Korea Reformed Theology. 48: 38–71. Chisholm, Hugh, ed. (1911). 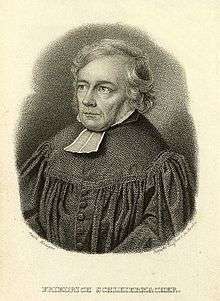 "Schleiermacher, Friedrich Daniel Ernst". Encyclopædia Britannica (11th ed.). Cambridge University Press. "Friedrich Daniel Ernst Schleiermacher". Stanford Encyclopedia of Philosophy. Böhme, Traugott (1920). "Schleiermacher, Friedrich Ernst Daniel". Encyclopedia Americana.